Spark plug gap. The "gap" is the distance between the ground electrode and center electrode. The further the two are apart, the more potential (voltage) that is required to arc, or jump that gap. Some people run a super tight gap, because of misfire issues. If the car is pretty stock, then it should have no issue arcing or firing across 1.1 mm or 0.044 inch. At bigger power you might go down to 0.8 mm or 0.031 inch. Generally a bigger arc is going to give you a more complete burn in the combustion chamber. This is from NGK on spark plug gap. "Although the NGK factory will set the gap to a preselected setting, this may not be the right gap for your particular engine. The incorrect plug gap for your engine can contribute to a high rate of misfires, loss of power, plug fouling, poor fuel economy and accelerated plug wear. It is always best to check the gap against the manufacturer's specifications. If adjusting the gap on fine wire or precious metal plugs such as platinum or iridium, be very careful not to apply any pressure or prying force to the fine wire center electrode or insulator as they can be damaged. The gap should be adjusted by only moving the ground electrode. Another consideration that should be taken into account is the extent of any modifications that you may have made to the engine. As an example, when you raise compression or add forced induction (a turbo system, nitrous or supercharger kit) you must reduce the gap (about .004" for every 50 hp you add). However, when you add a high power ignition system (such as those offered by MSD, Crane, Nology) you can open the gap from .002-.005"." Lots of guys like to run the cheap copper plugs. I never had much luck with them. Electricity takes the path of least resistance. You can see one owners fix for leaking spark, that was causing misfires on his Nissan Skyline GT-R. Watch the video if you have an RB26. Sometimes just a little work/cleanup is required to fix an issue, rather than just parts replacement. However a lot of people would just rather replace a part than fix something they already have. Too many people get new "aftermarket" coils, which may fix the issue, but really don't address the issue. The combustion chamber is a very harsh environment. Lots of heat, lots of pressure. Heat = resistance. 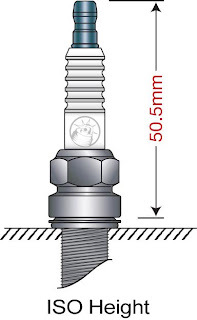 High resistance means the spark will not arc across the spark plug gap. This is why I like the Iridium plugs. Fine wire on the center electrode makes it easier for the arc to jump. The really expensive, and good plugs, are double fine wire. A lot of people also run the "K" or ISO length plugs. These are 2.5 mm shorter than the JIS plugs. If you are trying to get the most out of your ignition system, don't short anything. 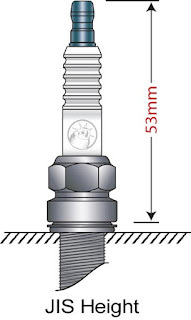 JIS length - 53 mm from seat to plug tip. STD GT-R plugs are JIS length. Double fine wire Iridium plug. If you are serious, run these. 7436-10 on the left, BCPR7EIX on the right. NGK IRI (WAY)(TOP)(MAC) plugs have a 0.6mm iridium tipped Center Electrode with a tapered cut ground and are sold under the name Iriway, Iritop and Irimac throughout Japan and other select countries. In the US and Europe these same plugs have been released under the IX Iridium Series and can be identified by their alphanumeric part numbers. The list below shows appropriate interchanges. The IRI Series and IX Series are produced in the same NGK factory. They are identical in construction, with packaging and marketing being the only difference. If the sparkplug threads are all wet with oil what does it mean on an RB26? Tips are dry, no bluish smoke on exhaust. Was puzzled to find the threads are wet. Wet threads on all them? Maybe just some oil sneaking by. Maybe when adding oil. Maybe old stuff stuck in the threads from last time. Not much to be concerned with honestly. Monitor. See if anything changes. Also heard some owners and tuners hate iridiums. Is heat range 6 ok in a street seldom used Gtr that is around 390hp or you would already recommend 7? Because some say 7 fouls earlier especially if the car isn't used a lot. I wouldn't put too much into it. Clean and monitor. 7 are fine for a seldom used car. I actually run -10's and they need a good run to clean them off every now and then. I like iridium, as they are easier to fire than other plugs. The electrode can be thinner. Yeah was also thinking of blowby oils or going out turbo seals. 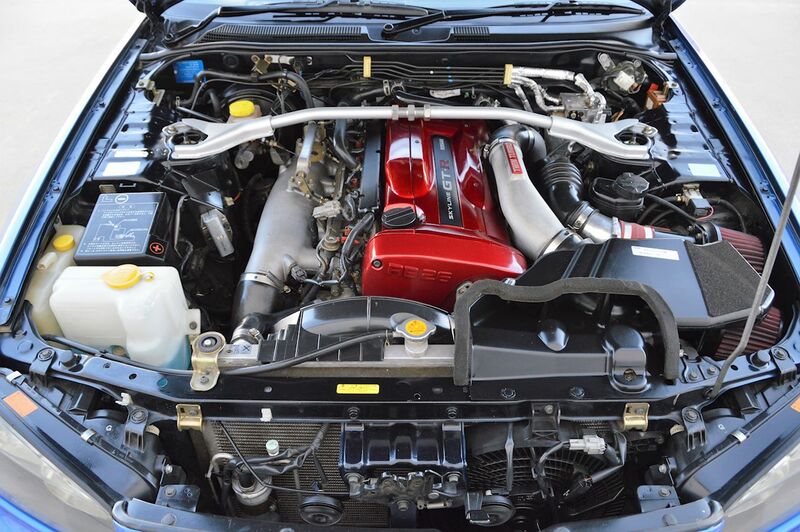 Also thinking of oil catch cans coz I know the RB26 move oils around on the system right? Thanks for the tip. Guess I'll be going cold plug 7 iridiums next year.